Jiang Da Hong says: “…if you want to know what is true in the 8 houses, you have to know the numbers in the 9 palaces…”. What are the numbers in the 9 palaces? What is the significance of the 9 numbers to feng shui? Is he referring the 9 to the 9 stars or 9 palaces? I share my thoughts on this subject. To understand a house, we have to know the numbers in the 9 palaces. To know is to understand and be able to apply the knowledge of the numbers in the 9 palaces. With these 9 numbers & it’s combinations of numbers, one can tell the house well. If one does not know nor understand the significance of these 9 numbers in the 9 palaces then how can one tell the house? Perhaps, why some practitioners and students are frustrated with flying star and label it as fake is because they have failed to understand the deeper part of 2nd portion of this verse or reduce flying star to merely a divination tool. How do we want to understand the numbers? Most will know or understand the individual stars like Star #1 is the Tang Lang Star which represents Intelligence star and so forth, and most, I believe also knows about the 81 combination of stars. This you can find on the bookshelfs any major bookstores. A little difference in the meaning from different authors but more or less you can find it quite easily. This is rather an easy task for basic level. Finally to understand the deeper meaning one has to be adept in knowledge of Yi Jing or I-Ching. Understanding seems an easy task! Not really, but let’s put this question aside for a moment and move on to the next part & that is how to apply the numbers then we come back to understanding later. And yes application is the most tricky & critical part. To illustrate, I take the example of a room layout I posted in Facebook couple of days back to keep things less complicated. Can you spot the 4 sets of numbers? This is where the major difference between authentic Flying Star and the general Flying Star readily available in the market. This is what sets apart the effectiveness between Wu Chang and other Shen School of Flying Star (common Flying Star). In authentic Flying Star, you can also makes a difference to the feng shui of the room by changing the Qi of the room door. Knowing the Qi of the room’s door is a concept known by most practitioners but what they don’t know is that the Qi is dynamic and not static. This is the advance concept of Wu Chang Flying Star. So, if one does not understand the numbers thoroughly, how can one change the Qi correctly & effectively? This is important as each number adds a layer of information to your flying star. Once you know it then you can better improve your bedroom feng shui for example. If one superimpose the chart onto the house using 8 pie or 9 grid, knowing exactly the Qi inside each room is a challenge especially when you see a line dividing a room. This reduces the chance of getting one set of the numbers correct. So by not knowing the full sets of numbers, one is already missing the vital link in understanding what is going on in the room, why this person had an accident last month and so forth and this is the 2nd lesson we ought to learn. 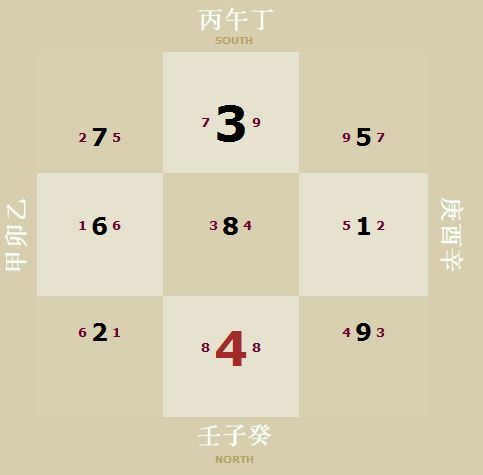 Therefore, correct understanding the numbers and in it’s application is indeed a daunting task for the commoner Flying Star and it is no wonder the Feng Shui works at times and don’t work on other times. And the reason behind is simply because they cannot predict the house and if something has gone bad, how can they explain. Blame the mirror, the toilet bowl behind, the beam on top or lamp post? If something good happens then how they explain? The Bazi is good, the wealth vase did the job, or last weekend he move the furnitures or the new aquarium ‘activated’ the qi? Summing up, the few important points to capture is Internal Feng Shui is not important compared to the effects from the Stars and having the correct understanding of the numbers in the 9 palaces and how it is applied can allow one to properly set a strong house feng shui so it can sustains good feng shui over the longer term. In fact, there are more layers into telling the 9 numbers in the 9 palaces but for now I hoped you have enjoyed this posting.